Some days you are the pigeon, some days, the statue. 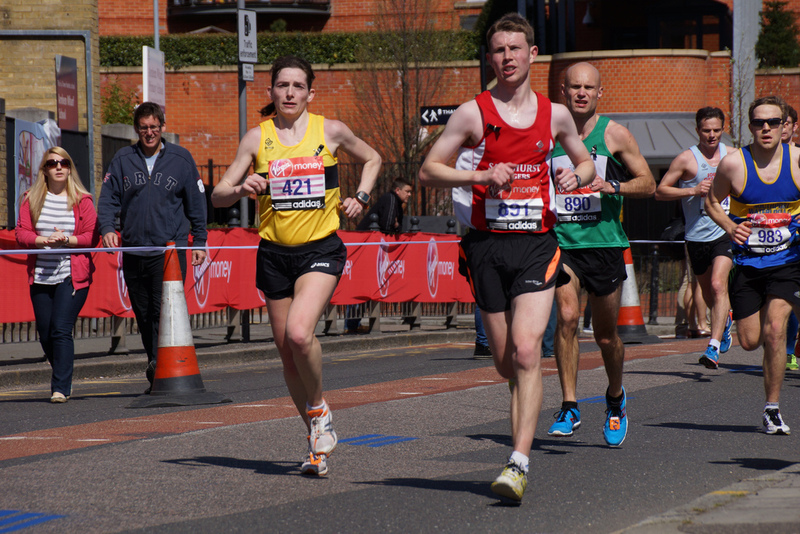 Bracknell Half Marathon was planned to be a little zone 2 run as part of our training. It was off the back of a 100 mile (heinously hilly) bike ride and Hart tri the weekend before, so good for endurance. It should have been quite pleasant. How wrong I was. I had been ill with a nasty head cold since Wednesday evening. Initially, I thought it was the cold from the lake that had made me sneeze, but the aches and lethargy told me this wasn’t the case. But, it was all above the neck, so it should have been OK. I was so bunged up from this cold that I couldn’t breath out of my nose and my asthma had been quite bad too. I won’t go in to details, but what was coming out of my nose certainly didn’t look like it had come from Planet Earth…. So we arrive, pick up our numbers, do the obligatory faffing and make our way to the start. It was here that I realized my heart rate was quite high, over 100 at rest. But, heart rate training is about keeping it within your zone, so that didn’t matter did it? And quickly we were off. I was looking forward to a jaunt around Bracknell where I work and a tour of some of the schools I work in. Indeed on the way round I think I saw half of the staff from Bracknell Forest schools. Last year was my first Bracknell Half and despite it being very hot, it was lovely to support my good colleague and friend around her first half marathon. I remember being impressed with the course and pleasantly surprised. My heart rate lept up straight away and my watch was beeping and buzzing. I had wanted to do this run “naked” but had forgotten to turn the alerts off. It didn’t matter in the end and it just buzzed constantly all the way and I ignored it in the end. I said goodbye to my partner in crime Serena and got my head down. At mile three I was feeling shocking. My heart rate was jumping up and down and going quite high. So I slowed more to keep it down. This didn’t work and if I had slowed any more I would have been going backwards. This really was the order of the day, until 6 miles when the balls of my feet started to hurt. I have used Asics for many years and loved them but the new pair (about 100 miles worn in) are so uncomfortable. I had a similar experience at Reading Half. An email has been sent to Asics. Normally, I love meeting new mates and having a chat during events but today I couldn’t chat, I couldn’t even concentrate on what my new mates I met on the way round were saying. I was feeling bad. Then at mile 9, I really thought I wouldn’t finish. To date I have never had a DNF. I didn’t want one in my own back yard, but I was feeling shocking and testing the pain gate theory. My stash of tissues had been used up and I couldn’t even eat my snacks I had brought. I never go off my food, ever. Coming up to 10 miles, a colleague from the speech and language service passed me and said hello and I nearly had a cry. I never cry whilst running. Maybe at the end, or at the beginning as I did in Weymouth last year, but never during. I normally smile and enjoy it. So I put my head down and employed a run walk strategy, I think I had decided there was no way I wouldn’t finish, unless my heart rate kept climbing to silly numbers. I even started to do maths in my head to check I was ok. Just about managed my 8 times tables. And then to the end, such lovely support and seeing Viya (who I ran with last year) who had come to support and other friends as well as my great training buddy Serena who had picked my bag up for me. And I wanted to cry again! Oh dear, mind you, my feet were agony now, so maybe that was the reason. It was a shocking experience I never want to repeat, but I guess we tell each other to listen to our bodies, and maybe, now pushing 50 years old, I need to listen a bit more carefully. Maybe, perhaps. It was good to get a very large cup of tea and then sit on the grass with a few other joggers and have a chat. Thanks Deb for the cookies and flapjacks. I am amazed at how few do this event when it is right on our doorstep. It is a slightly hilly twisty turny course, but it takes you around Bracknell and you realize there is more to Bracknell than industrial estates and concrete. I think it was whilst I was sat on the grass that I got bitten on the inside of both ankles by what I can only think was a horsefly as I am now sporting some lovely cankles. Horseflies don’t like me! However, having said all of this, you have to take a positive from it somewhere. My number was 888, and 8 is a lucky number in China, it was also the name of Nick Leeson’s account that he set up when he lost all of that money for the bank he worked for. Maybe I was more Nick than lucky number today. Nevertheless, I got there, and next year, I know when I am doing an event that we have planned, it will hurt and hurt some more and I will want to stop, so I will be able to remember Bracknell Half to help me through it. Next year, I aim to be the pigeon. Last year I went straight from Bracknell to play in a ladies cricket match. It was fine, and I was tired at the end, but it was fine. This year, I had to call the manager and say I wouldn’t make it. I don’t think I could have even driven to Alton, let alone play a 35 over match. Unfortunately the reserve was my daughter who also has this bug! I would imagine my name was mud at the match today! Sorry Yateley ladies.